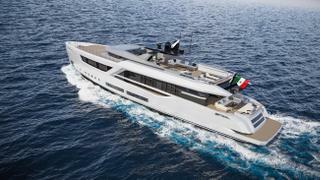 Italian yard Baglietto used the occasion of the Fort Lauderdale International Boat Show 2017 to reveal a new 38 metre superyacht concept developed in collaboration with Hot Lab. The brief for the V-Line 38 was to keep the shipyard’s traditions prominent, while driving forward with innovative ideas at the same time. This can be seen in the hardtop’s geometrical fin and the almost vertical prow, which allows for more interior volume. 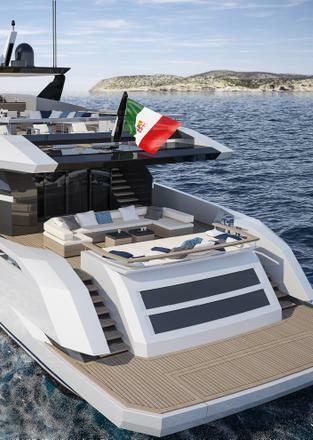 Michele Gavino, CEO of Baglietto, said: “We have made great strides in research and project development over the last few years to define different platforms and contemporary design with the assurance of maximum comfort and performance. The partnership with Hot Lab is an example of our dedication”. 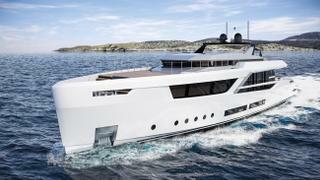 The smallest member of the V-Line collection to date, this new design could be built in either raised pilothouse or tri-deck versions. 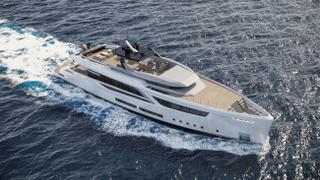 Other optional extras include a fold-out superyacht terrace, which can be incorporated into the starboard side of the main-deck master cabin. Moving upstairs and the superyacht sundeck is divided into several distinct zones, including conversation areas, sunpads and an al fresco dining space with room for up to ten guests. Finally, a transformer swim platform allows a wide range of tenders and toys to be launched from the aft garage. This latest design completes the V-Line collection that began at the Monaco Yacht Show 2016 and now comprises 41, 44 and 50 metre concepts from Santa Maria Magnolfi as well as Hot Lab.